Dubai, April 16, 2018: Al-Futtaim Honda, exclusive distributor of Honda cars, bikes, marine engines and power products in the UAE, has announced that the Honda Jazz, Accord and CR-V has won top honours at two leading automotive award functions. The recently launched Jazz won Best Compact car award at the annual Wheels Car of the Year awards while the CR-V and Accord (has since undergone a full model change and was launched in the UAE last month) won best Midsize Sedan and Best Small SUV respectively at the Middle East Car of the Year (MECOTY) awards. The all-new Jazz comes loaded with features including a new 7.0in colour Display Audio touchscreen with swipe and touch functionality, Steering Wheel Mounted Controls, keyless entry, cruise control, rear parking sensors. The Jazz exudes a bold confidence too with its sporty, lower and wider look while under the bonnet is a peppy 1.5-litre Direct Injection i-VTEC engine that generates 130hp and 155Nm of torque. Now in its 5th year, the MECOTY awards are the biggest, most coveted awards ceremony of the regional automotive industry and the judging panel includes some of the most respected motoring journalists from around the region. Winners of the MECOTY awards were chosen based on test drives by the jury members and public voting. The new CR-V has a bold new styling, a more premium interior and a host of new features and technologies. The CR-V targets the highest levels of quality and driving refinement in its class with top class steering precision, ride comfort, body control and cabin quietness. 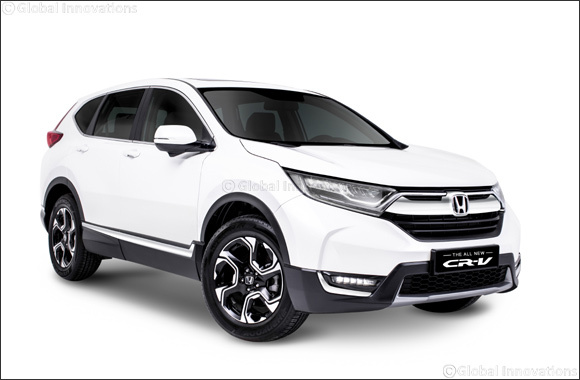 The CR-V is powered by a 2.4-litre DOHC, direct injected i-VTEC engine that is mated to a smooth shifting and sporty continuously variable transmission (CVT) with Honda G-Shift control logic.